Good morning! I heard you were eager to get some tips on how to draw... I'm still learning, but I can share a few key areas to focus on. So if you're interested, I'll take you on a day out to town, we'll walk the streets, grab some lunch and coffee, and draw the city together. Urban sketching can look pretty loose and stylised, but any stylistic or abstract drawing should develop naturally. That is to say, you've grasped the fundamentals of drawing and practised to the point that the rules have become second nature, and you are confident enough to move your pen freely without being dictated by what you see. Instead, it becomes how you feel. Think back to when you were learning to write... you would practice every single letter separately until they were of the right shape and height, then you would start to write in cursive, and your neatly spaced letters blurred into a somewhat legible scribble. It's the same principle, you gained enough confidence and experience in writing to bend the rules and form your own style. So before you rush into quirky depictions of buildings, people, interiors, practice the basics and nail them down in their most realistic form first. Creativity will come naturally. Did you groan? I know, it's been hammered into your head, you need to know perspective. Flat sketches are fine, I do it often for a quick interpretation, but perspective creates a sense of space and atmosphere. When you draw in perspective, you draw from an angle that is unique to you and the way you see things, it creates a personal connection with the viewer and you allow them to be a part of that space. Our sketchbooks can only show so much of what our eyes can see, take this as a blessing in disguise. Think carefully about your subject. There must be an element in that building, or that person, or that scene, that made you want to pick up your pen. Bring the focus onto it. 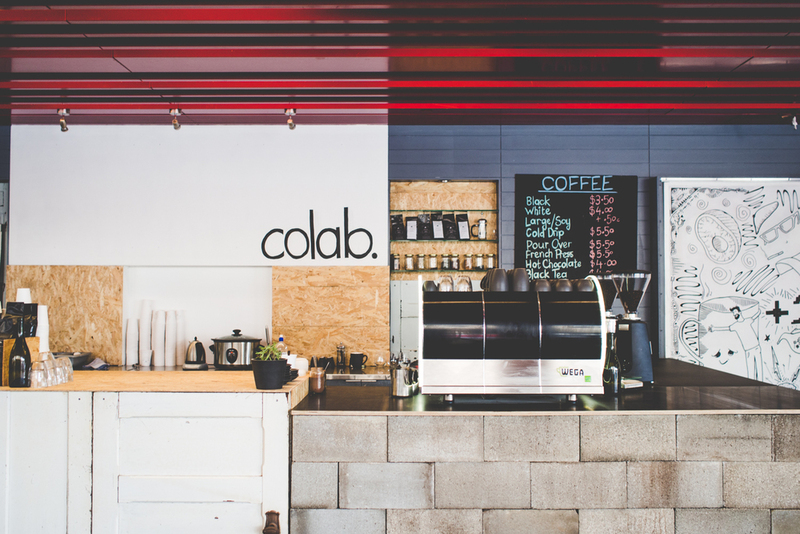 Let's grab some lunch at Colab. and check out their decor. Wherever you are, there is a personality or emotion that is attached to the place you are in, and the things that you see. Let your pen translate those feelings onto the pages. What was memorable about the place? Emphasise it. I guess my favourite thing about Colab. was its casual, laid back - almost lazy - atmosphere. The artwork on the wall made me want to doodle and scribble and keep it fun and simple. Nano's bright yellow counters are always the first things that come to my head when I think about the cafe. That, and the endless flow of customers. Even people! Chakey and Jin at By Blackbird have always been a fun, lighthearted and cheerful couple that brightened my day. So I kept these 'portraits' quite simple and comical. 127 Days' black tables and dark walls are the first things that stand out to me every time I visit. My sketches take around half an hour max. It depends on the detail and amount of watercolour I'm applying to the sketch. Yes, I always carry my tools with me so I can draw on site, but I leave my watercolours most of the time and apply them at home. It's too much to carry if I have textbooks from university as well. I always sketch and plan on site, if I have enough time to hang around, I'll finish the drawing then and there. If not, I'll use photos to finish it at home. I take photos regardless of whether I'll be drawing or not, for the sake of my blog posts. So that concludes our day out! I hope this was useful to you in some way. Do let me know if you want to see more of this, or if you have more questions. I still have a lot to learn, but I do want to share this with you because I really appreciate all the support that you give me just by reading my blog so, thankyou.